Notify us of absences and tardiness. Children are naturally eager to grow and learn. We strive to encourage this curiosity yet challenge our students. Our team of teachers and administrators bring together their expertise and experience as they collaborate, develop, and implement a curriculum designed to prepare students for academic success in high school and beyond. For our littlest learners, we offer a comprehensive preschool program for three-year-old children and a pre-kindergarten program for four-year-olds. Set your child on a quest for learning in our nurturing, safe environment. Our teachers lovingly instruct these energetic, eager children in important fundamentals as they instill a desire to serve our Savior, Jesus Christ, through service and kindness to our fellow man. We at St. James School consider it a privilege to partner with parents in the education of children. We believe parents are the primary educators of their children. We recognize you as the key role model in the development of your child’s life, physically, mentally, spiritually, emotionally, and psychologically. 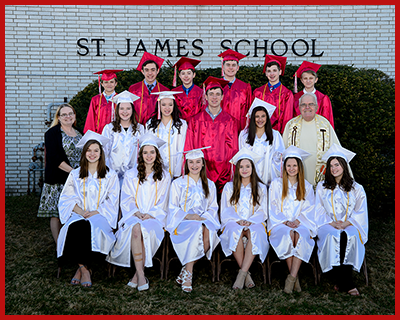 Choosing to enroll your child at St. James School involves a commitment and exhibits your concern for helping your child to recognize God as the greatest good in his/her life. Good example is the most effective teacher in these important, formative years. Parents and teachers must not doubt the sincerity of the efforts of their educational partner. We must not allow ourselves to get caught between the student and the other partner; this situation will never yield a positive return. Dividing authority between school and home, or within the home, only teaches disrespect of all authority. If there is an incident at school, we request parents make an investigation of the complete story. This evidence of mutual respect is a model of mature behavior and helps children develop strong relationships. Together, let’s commit to a successful partnership as we support one another in helping these precious children become the best they are capable of.